The BMW N74 is a twin-turbo V12 petrol engine which replaced the N73 and has been produced from 2008 to present, production will end in 2023. It is BMW's first turbocharged V12 engine and is also used in several Rolls-Royce models. As per its predecessor, the N74 has direct injection, DOHC and variable valve timing (called double-VANOS by BMW). However, the N74 does not have variable valve lift (called Valvetronic by BMW). The N74 marked BMW's first use of an 8-speed automatic transmission, in the form of the ZF 8HP90. This initial version of the N74 has a bore of 89 mm (3.5 in) and a stroke of 80 mm (3.1 in). The redline is 7000 rpm and the compression ratio is 10.0:1. The N74B66 is an enlarged version of the N74B60, due to a stroke of 88 mm (3.5 in). The redline is 7000 rpm and the compression ratio is 10.0:1. It produces up to 465 kW (624 hp) and is used in the Rolls-Royce Ghost. The 6.8 litre version was introduced in the 2018 Rolls-Royce Phantom. It is also used in the Rolls-Royce Cullinan SUV, built on the same platform as new Phantom. ^ "BMW's biggest engine - the V12 - is safe until 2023". www.topgear.com. Retrieved 4 April 2019. ^ a b c "2010 BMW 760Li – Second Drive – Car Reviews". www.caranddriver. Retrieved 12 March 2017. ^ "Information on N74 engines". www.bmwheaven.com. Retrieved 11 August 2017. ^ 25 years of BMW 12-cylinder engines: setting new standards in the luxury class. Munich, Germany: BMW Corporate Communications. October 2012. Retrieved 11 August 2017. 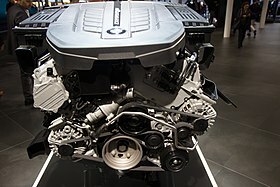 ^ "BMW N74 engine". www.australiancar.reviews. Retrieved 12 March 2017. ^ "BMW N73 and N74 V12 Engines". www.unixnerd.demon.co.uk. Retrieved 11 August 2017. ^ "BMWBLOG Road Review: 2013 BMW 760Li – The Power of 12". www.bmwblog.com. Retrieved 11 August 2017. ^ "The new BMW M760Li xDrive". www.bmwgroup.com. Retrieved 11 August 2017. ^ "Watch BMW's twin turbo all wheel drive V12 G11 M760li hustle to 162 miles per hour". www.bimmerboost.com. Retrieved 11 August 2017. ^ "BMW N74B66TU / M760li xDrive". www.drive2.ru (in Russian). Retrieved 11 August 2017. ^ "RealOEM.com - Online BMW Parts Catalog". www.realoem.com. Retrieved 20 November 2017.